Appellation or Vine Barbera d'Asti D.O.C.G. It origins from the grapes harvested in the steep and sunny amphitheatre vineyards overlooking the tower of the Castle. 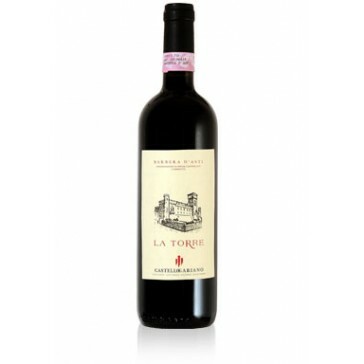 A noble wine, born to convey deep feelings; the taste is vivid, balanced and all-encompassing. Characterized by a great intensity and body thank to the aging in big barrel. The color is ruby red with light violet shades. The fragrance is typical, with fruits and violet scents. The taste is intense and balanced, moderately tannic. The Marquises Cattaneo Adorno Giustiniani are engaged in an intense wine production. The estate is located in Gabiano, on an area of 260 hectares, 20 of which destined to vineyards. The wine production favors the low rendering and the wine is bottled only during the best vintage-years in order to assure the higher quality of the wines. The wine ages in the ancient cellars under the Castle. Here, a modern winery combines the traditional wine making knowledge of the family to most sophisticated equipment for the fermentation at controlled temperatures. It can be a lovely match with main courses, white and red meats, medium aged cheese. To be served at 19-20° C.
Store in a cool spot, with fixed-temperature. The bottles should be places horizontally. This is a kind of wine which can continue to evolve and increase its quality with aging.